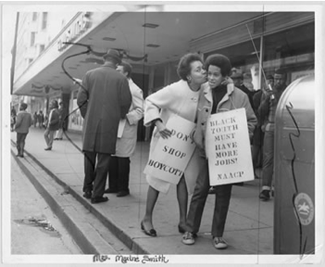 Maxine A. Smith at downtown business boycott. Courtesy of Memphis Public Library. Used with permission. This month's featured collection is Volunteer Voices. International Joint Conferences on Computer, Information, and Systems Sciences, and Engineering (CISSE 09), 4 - 12 December 2009. This is an online conference. Call for papers. The submission deadline is 12 October 2009.
International Conference on Digital Libraries (ICDL 2010), 23 - 26 February 2010, New Delhi, India. Call for papers. The submission deadline is 15 October 2009.
emtacl10 - emerging technologies in academic libraries, 26 - 28 April 2010, Trondheim, Norway. Call for papers. The submission deadline for abstracts is 15 October 2009.
International Conference on Computer Supported Education (CSEDU), 7 - 10 April 2010, Valencia, Spain. Call for papers. The submission deadline is 21 October 2009.
International Conference on Web Information Systems and Technologies (WEBIST), 7 - 10 April 2010, Valencia, Spain. Call for papers. The submission deadline is 21 October 2009. FOIS 2010 6th International Conference on Formal Ontology in Information Systems, 11 - 14 May 2010, Toronto, Canada. Call for papers. The submission deadline is 23 October 2009. Electronic Resources & Libraries 2010, 1 - 3 February 2010, Austin, Texas, USA. Call for papers. The submission deadline is 30 October 2009. IADIS International Conference e-Society 2010, 18 -21 May 2010, Porto, Portugal. Call for papers. The submission deadline is 30 October 2009. IADIS International Conference Mobile Learning 2010, 19 - 21 March 2010, Porto, Portugal. Call for papers. The submission deadline is 30 October 2009. IMLS (Institute for Museum and Library Services) Call for 2010 Museums for America Grant Applications. The submission deadline is 2 November 2009. Twelfth International Conference on the Principles of Knowledge Representation and Reasoning, 9 - 13 May 2010, Toronto, Canada. Call for papers. Submit title and abstract by 20 November 2009 and full papers by 30 November 2009. 2nd International Conference on Imaging Theory and Applications (IMAGAPP), 17 - 21 May 2010, Angers, France. Call for papers. The submission deadline is 22 November 2009. 5th International Conference on Computer Vision Theory and Applications (VISAPP), 17 - 21 May 2010, Angers, France. Call for papers. The submission deadline is 22 November 2009. 5th International Conference on Computer Graphics Theory and Applications (GRAPP), 17 - 21 May 2010, Angers, France. Call for papers. The submission deadline is 22 November 2009. Joint Technical Symposium 2010: Digital Challenges and Digital Opportunities in Audiovisual Archiving, 2 - 5 May 2010, Oslo, Norway. Call for papers. The preliminary submission deadline is 1 December 2009. Chicago Colloquium on Digital Humanities and Computer Science (DHCS), 14 - 16 November 2009, Chicago, Illinois, USA. Fourth European Conference on Technology Enhanced Learning: "Learning in the Synergy of Multiple Disciplines"
Second Workshop on "Very Large Digital Libraries"
DC-2009 "Semantic Interoperability of Linked Data"